To me these cards speak to the financial difficulties that so many of us are having during this recession. 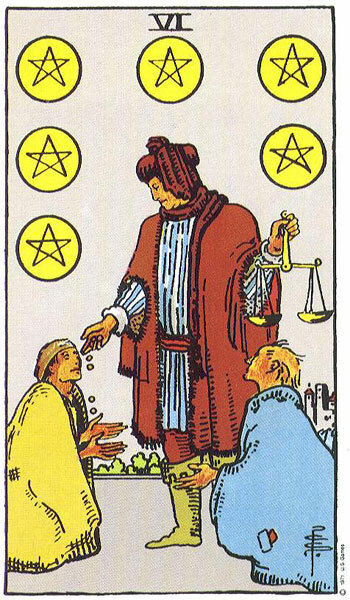 Looking at these cards, it appears to be raining money — if only it were that easy! 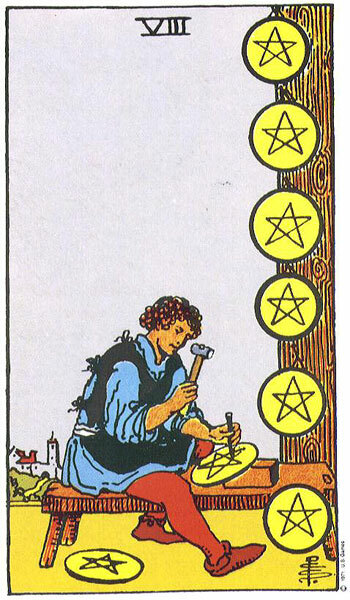 The Six of Pentacles says to me that we have to first position ourselves to give and to receive — and then throw our backs into the hard work and attention to detail of the Eight of Pentacles. So what is the lesson here? Generosity, both in terms of giving and receiving, plays a role in material success — but so do hard work and planning. Both must go together–hard work won’t do any good if you are not in a position to, for example, sell your product that you worked hard to make, or find the job that you worked hard to develop the skill set for. So, work hard and plan, but then position yourself to be part of the flow of the economy — and today is a good day for this.